Has RIM been taking a leaf out of Samsung's book? 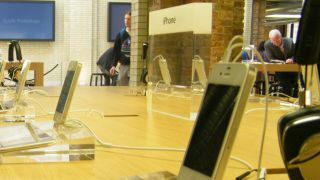 While, based on its priors, Samsung had received much of the blame for the 'Wake Up' protests outside an Apple Store in Australia, a new report suggests another rival manufacturer may have been behind it. MacWorld has uncovered evidence, of sorts, that BlackBerry maker RIM was behind the Flashmob, which saw a group decant from a bus and chant "Wake up" at iPhone shoppers in Sydney. The site has examined the source code within the Wake Up online presence and discovered a Double Click URL that has ties to the RIM Australia. Samsung last week issued a public denial amid allegations that the stunt may have been part of the recent Galaxy marketing campaign that had poked fun at Apple fanboys, referring to them as "sheep." "Samsung Electronics Australia has nothing to do with the 'Wake-Up Campaign,'" the company said in a statement. So while RIM remains miles behind Samsung in terms of developing devices to reel in the iPhone, it looks like the BlackBerry maker is even further behind in the 'mocking marketing campaign' stakes. UPDATE: Later on Monday evening, RIM came clean and admitted it was indeed behind the campaign. A statement from the Canadian smartphone giant reads: "We can confirm that the Australian 'Wake Up' campaign, which involves a series of experiential activities taking place across Sydney and Melbourne, was created by RIM Australia."